This unique building, near the village of Sidney in the Rural Municipality of North Norfolk, was constructed in the early 20th century by Frank Thomson for the Booth family. 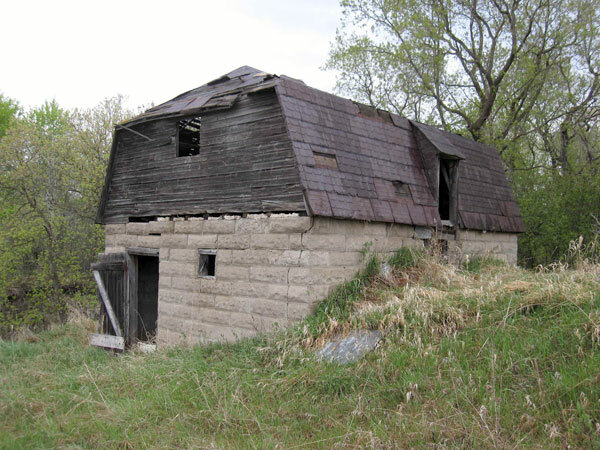 Built of locally manufactured concrete blocks, it is situated on the side of a hill so the farmer could transfer the harvested crops into the granary from the uphill side and, when it was time to deliver grain to a local elevator, it was simple matter of parking a wagon on the downhill side and letting gravity do the work. The downhill side of the building had two openings, one for the main floor and one for an upper floor, so the farmer could store grain on both levels. This page was prepared by Neil Christoffersen and Gordon Goldsborough.